How do you get asparagus stiff and bright green for eating? Ice or what?? I'd like to serve asparagus to my guests as "finger food" but when I cook asparagus and then put it on ice, it doesn't seem to shock them. What should I do? 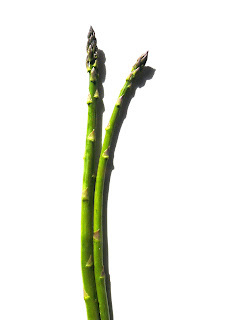 Dear "New to all this"
All you have to do to shock asparagus is to tell them you're pregnant. Kidding! Fresh asparagus needs very little cooking to produce bright green spears that will have a nice crunch. To shock asparagus, dip spears in a shallow pan of boiling water ever so briefly (one minute for thin spears, two for fat) and use slotted spoon to transfer to a bowl of ice. Serve with aioli or olive oil, salt and pepper. Enjoy!